ChampCash claims you can become a millionaire by doing easy tasks like downloading apps, taking surveys, etc. But is ChampCash a scam or really a great way to make money? 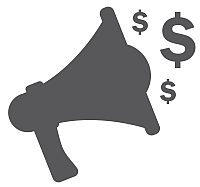 Let me start by saying that I have never before seen a legit site that offers paid surveys and other micro tasks claim you can become a millionaire by doing this. I was therefore very suspicious about ChampCash – It does however have some potential, but also some big risks. In this ChampCash review I will give you all the details, so you will know what you are getting into before joining. What is ChampCash and what does the site offer? ChampCash is a company located in India and is a digital India app and claims it want to help everyone make money online easily (not just people from India). It is quite different from other sites I have reviewed here at PaidFromSurveys.com, as the main way to earn here is not by taking surveys or doing other micro tasks – you can do this on the platform, but it is not the main idea of ChampCash when you take a closer look. The platform is first of all build on MLM, where you can build your income by inviting other people. It has 4 steps you need to do to join and earn. ChampCash is an app you need to install, so you need to start by downloading the app. You can also register on the website. Be aware that to register you need to have a code from somebody referring you. You need a sponsor to be able to join CashChamp. If you do not have such a code, you need to contact ChampCash. Already here the big focus on building the network becomes obvious. This is quite unusual for sites that offer paid surveys, download of apps, etc. Later in this review you will find out just why this is such an important part of ChampCash and what the potentials and risks are about this. This is where it starts becoming a little weird. To even become a real part of the network/platform, you need to complete a challenge. The challenge is just to download a bunch of apps on your phone, so it is not difficult – just a little strange. To become a real member you need to complete a challenge. The reason for this step is that this is how ChampCash makes its money. They get paid from advertises, when users for example download their apps. This is also a part of what later can make you money, if you invite other people to join. As mentioned earlier, ChampCash is build on a MLM model, which means to make any real money, you need to invite others to join. You will then earn commissions every time someone you invited completes a task, downloads an app, etc. ChampCash pays in 7 levels. ChampCash has a 7 level referral program. For everyone, you directly invite, you will earn 50% commissions, level 2-5 you will get 10%, and level 6-7 will give you 5%. This might sound very appealing, but be aware that inviting friends is not as easy, as it may sound. It can actually be quite challenging, and it can also be a way to really annoy your friends. It will take a lot of effort to really make it work. But more about the earning potentials later. Not until this step, you get access to the daily income sources. This is where you can take paid surveys, online offers, shop online, download more apps, etc. You will get paid a small reward for everything you do here, and will also get paid when people you invite completes tasks here. In my opinion the options ChampCash offers here are not very good. It is clearly a platform build around you having to invite other people. If you instead want to earn by just taking paid surveys and do other micro tasks without having to be involved in the MLM aspect, there are many sites with A LOT more and A LOT better opportunities. Below you can see the official video where ChampCash itself describes what it offers. I want to make it clear that I do NOT agree with all the claims in this video, and strongly encourage you to keep reading below the video before joining. When you earn on ChampCash, you can choose between 3 main payout methods. You can get paid in cash to PayPal/your bank account, you can get mobile credit, or you can get gift cards to for example Flipkart and Amazon. Personally, I prefer PayPal as a payout method, as it is very easy and fast, and I prefer sites that offer PayPal, so glad to see ChampCash offers this. However, even though it has some good payout methods, and you can find a great option no matter your preferences, it might not be worth it. Let’s look into the earning potential to understand this further. How much money can you earn with ChampCash? ChampCash itself claims that anyone can become a millionaire by referring other people to the app. ChampCash claims everyone can become a millionaire with this app. This is a very bold claim. But there is no doubt that if you want to make any real money with this app, you have to invite friends, as the other earning opportunities are NOT very good. 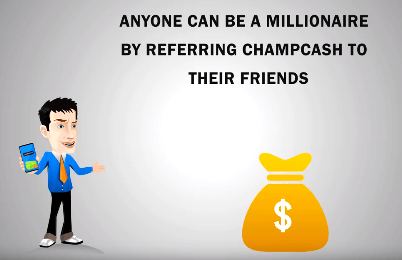 In the video I had earlier in this review, ChampCash makes it look like it is very easy to make a million dollars by inviting friends. You are told you basically just have to invite 10 friends, who will invite 10 friends, etc. for 7 levels. They show a chart that explains just how this works. When you just look at this it looks very simple. The problem with this is however that it is NOT as easy to get 10 friends to join as you might think. People are in general very skeptical about joining programs, where they can only earn by recruiting and selling the idea to other people. So finding 10 friends that will actually join and do the challenge, which it takes for you to get paid, can be difficult enough. In addition to this, for this really to work each friend has to be able to convince 10 of their friends, etc. 10 people might not seem like a lot. But before you find 10 people that are willing to do what it takes to also promote the platform, you can have annoyed a lot of friends. So it is definitely NOT as easy as it sounds, and you should not let the very appealing chart and promise of a million dollar fool you. Potentially it could happen, but in my opinion it is VERY unlikely. Also, there are a few warning signs you need to take into consideration before joining, as I will show you now. Warning signs before you join? The whole model of how you have to earn on ChampCash is a risky one in my opinion. On the ChampCash website there are a couple of testimonials from users to show how great the platform is. Be careful believing these ChampCash testimonials. There are a couple of problems with these testimonials. First of all the names. John Doe and Jane Doe – these are names used for people that need to stay anonymous. John for a man and Jane for a woman. It almost seems like these where a part of the website template they used to develop the website, where they had written John and Jane Doe as place holders to show you needed to put real user testimonials here. But the developers of ChampCash did apparently not notice this and just left the names. 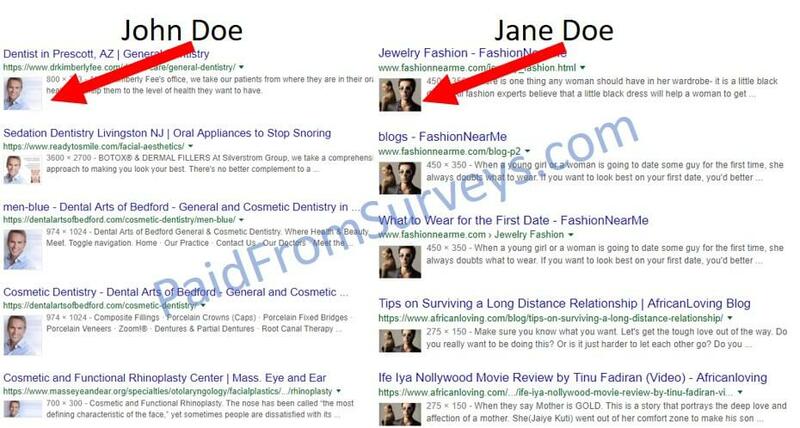 They even left Jane Doe as a name for a testimonial from a man. Kind of silly and almost funny:-) Just not that funny since they use it to try to convince us it is real users. This is very misleading in my opinion. In addition to this, I did an image search on Google, and both of the images look like stock images that are used for many other websites and projects as well. The images from the “users” are used on a lot of other websites as well. I my opinion you should therefore not trust these testimonials, and whenever I see a site using fake testimonials, I see it as a big warning sign. If it really was a great platform to earn money on, would it then not be easy to find real testimonials with real images? When you install the app, you have to give the app permission to A LOT of info to be able to join. This is a lot of information they need access to, and a lot more than I have ever seen any other paid survey or get-paid-to app requesting. I can understand why they might need the location of my phone, as some offers are dependent on the location. Since the platform is build on MLM and inviting friends, I can see why it also needs access to my contacts. But why would you need to give access to your images/videos, allow them to send and see your text messages, and to administer phone calls? Think about this – that is a lot of power you give them. I do not know about you, but I would not give an app like this access to sending and seeing text messages or administer phone calls. If you look at Google Play, where you can download the ChampCash app, there are a lot of positive reviews. At the moment of writing this review, it has more than 40,000 reviews and an average rating of 4.5 out of 5. 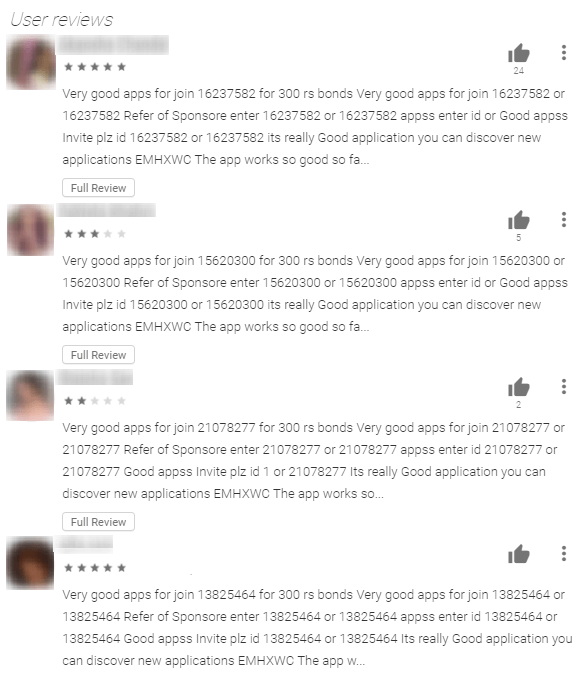 There are a lot of positive ChampCash reviews on Google Play – something strange is however going on. From this it looks like it might be an amazing opportunity. How can so many users be wrong? Well, if you look at the reviews, it is clearly one of the places people have been told to post to try to recruit new members. I did obviously not go through all the 40,000 reviews, but I scrolled through a lot of them. Most of them have the exact same text. Most of the reviews have the same text. It is a text in very poor English saying it is a very good app and then giving the referral code of the person writing the review, so people that use that code would be a part of that persons network. 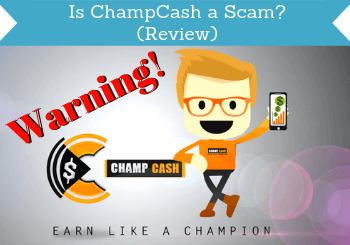 In my opinion you can definitely not trust these reviews, as it is clearly a way to try to get referrals, and from ChampCash’s side a promotional method to get a lot of positive ratings. When ratings are being forced/manipulated like this, it is in my opinion a big warning sign. Again, if it really was as great as they claim, there would be no need to use tricks like this. If you decide to join ChampCash, you can join no matter where you live. You just need to be 18 years old, and have an Android phone. However, no matter where you live there are sites with better opportunities. I would not call ChampCash a scam, as you can actually earn some money on the platform. This does however not mean it is worth it, as it in my opinion is not. But let’s sum up the pros and cons, so you can get a better overview and judge for yourself. You can earn some extra cash on ChampCash, and if you are good at building your network, it can also make you a decent amount. But do NOT expect it to be an easy way to make $1 million, as the sales video almost makes it look like. The whole way the app and system is built, is in my opinion too risky, you get access to few other earning methods, the app needs access to a lot of private info, and it is suspicious that they need to use fake testimonials. For these reasons it is NOT a platform I recommend. If you want to make some extra money by taking surveys, downloading apps, doing micro tasks, etc. there are many sites with a lot better opportunities, and where your earning opportunities do not depend on you bothering your friends. You can check out the best survey and get-paid-to sites in your country here. If you have any comments, questions, or have any experiences with ChampsCash yourself, I would love to hear from you in a comment below. You can earn some extra cash on ChampCash, but it will NOT be an easy way to become a millionaire, even though it might seem like it. In addition to this there are several warnings signs about the site, and all positive reviews seems to be fake or promotions. It is therefore NOT a platform I recommend.